Galiteuthis pacificus is a poorly known species that has never been fully described although broadly distributed in the tropical Indo-Pacific. Males reach, at least, a length of 333 mm ML. with a nearly square-shaped distal ocular photophore. without tubercules at the funnel-mantle fusion. Arm suckers with smooth rings. Adult males with distal half of arms I and II with greatly enlarged suckers with tiny aperatures. Figure. Oral view of right and left arms I and arm II and the base of arm III of a mature male, G. pacifica, Gulf of California, 333 mm ML, showing the enlarged distal arm suckers. Photograph by Henk-Jan Hoving. 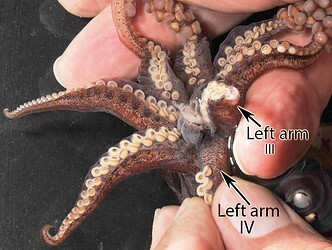 Tentacular clubs: Similar to other Galiteuthis with two series of hooks and no suckers on manus, short dactylus, and well defined carpal cluster. Figure. 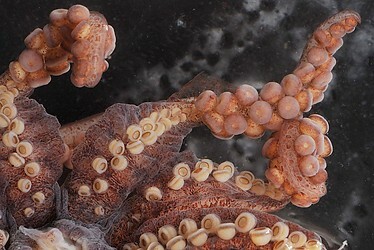 Oral view of the tentacular club of a subadult G. pacifica. Photograph by R. Young. Tentacles of mature males: Absent. Figure. Oral view of the arm crown of the mature male of G. pacifica, 333 mm ML, showing little trace of tentacles between arms III and IV. Note the broad protective membranes on the proximal half of the arms and their wide trabeculae. Photograph by Henk-Jan Hoving. Lateral (near lens) ocular photophore very short, nearly square. Figure. Eyes of G. pacifica, mature male, 333 mm ML. Left - Lateral view of the right eye. Right - Ventral view of the left eye. Note the U-shaped medial photophore and the near-square shape of the lateral (= distal) photophore. Photograph by Henk-Jan Hoving. Figure. Mantle cartilage at funnel-mantle fusion of G. pacifica showing absence of tubercules, 65 mm GL. Drawing from Young (1972). Overview: The mature male with the mantle cut open shows surprisingly sparse viscera. Figure. Ventral view of the viscera of G. pacifica, mature male, 333 mm ML. Photograph by Henk-Jan Hoving. 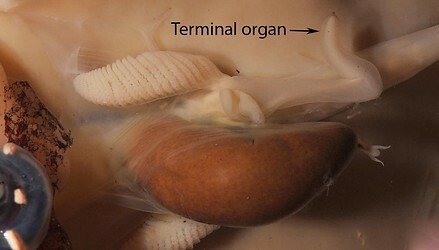 Male reproductive structures: The terminal organ seems to contain a single spermatophore and no testis was obvious. Possibly the squid was a spent male. Figure. Ventral view of the accessory reproductive structures of G. pacifica, mature male, 333 mm ML. Anterior is to the left in the photograph. Photograph by Henk-Jan Hoving. Figure. G. pacifica. Left - Dorsal and ventral views of a paralarva of 4.8 mm GL, Hawaiian waters. Note characteristic elongate mantle chromatophores. Bar - 1 mm. Drawings by R. Young. Right - Ventral view of a juvenils, 42 mm ML, eastern Pacific. Drawing from Young (1972). Figure. Lateral and anterolateral views of an adult male G. pacifica. In situ photographs from an MBARI ROV taken at 2307 m, Gulf of California. In the larger images, note the different stages of contraction of the eyelid which seems to involve a simple circular contraction. The time difference from the open eyelid to the nearly closed eyelid was about 2 sec. Also note the very large suckers on the arms and the absence of tentacles. © 2013 MBARI. Type locality - off Cocos Island, eastern tropical Pacific. A tropical Indo-Pacific species known from the western Indian Ocean to New Caledonia, Southern California, Panama and northern Chile (Nesis, 1982). In the Pacific its range extends north to 28°N in the central Pacific, 34°N in the California Current, and south to 30°N in the Peru-Chile current (Voss et al., 1992). 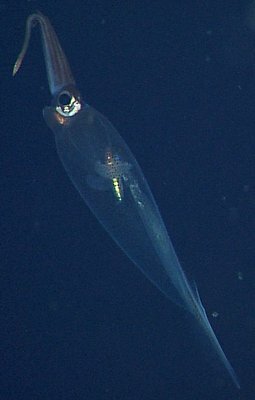 A study of the vertical distribution in Hawaiian waters (chart below) found most captures of squid greater than 20 mm GL in size came from depths of 700 m or more. This species does not appear to undergo diel vertical migration. Figure. Vertical distribution chart of G. pacifica, modified from Young, 1978. Captures were made with both open and opening/closing trawls. Bars - Fishing depth-range of opening/closing trawl. Circle - Modal fishing depth for either trawl. Blue-filled circles - Night captures. Yellow-filled circles - Day captures. Voss, N. A., S. J. Stephen and Zh. Dong. 1992. Family Cranchiidae. p. 187–210. In: Sweeney, M. J., C. F. E. Roper, K. M. Mangold, M. R. Clarke and S. V. Boletzky (eds.). 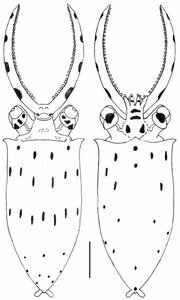 "Larval" and juvenile cephalopods: a manual for their identification. Smithson. Contr. Zool., No. 513: 1-282. 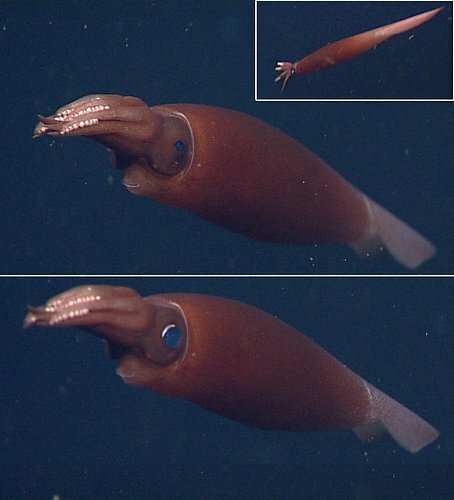 In situ photograph of G. pacifica taken at a depth of 1324 m. Squid not captured but note the diagnostic shape of the distal ocular photophore. Page: Tree of Life Galiteuthis pacifica Robson 1948. Authored by Henk-Jan Hoving, Stephanie Bush, Richard E. Young, and Katharina M. Mangold (1922-2003). The TEXT of this page is licensed under the Creative Commons Attribution-NonCommercial License - Version 3.0. Note that images and other media featured on this page are each governed by their own license, and they may or may not be available for reuse. Click on an image or a media link to access the media data window, which provides the relevant licensing information. For the general terms and conditions of ToL material reuse and redistribution, please see the Tree of Life Copyright Policies.